Floods: I am back in Pak! Pakistan should be on the book of Guinness World Record because thanks to our government and authorities we are under floodwater for fourth consecutive year, this year flood situation is similar to the pattern of 2010 floods that started after the record-breaking rains in the north and flood waters moved from the north and ended up in the Arabian sea. 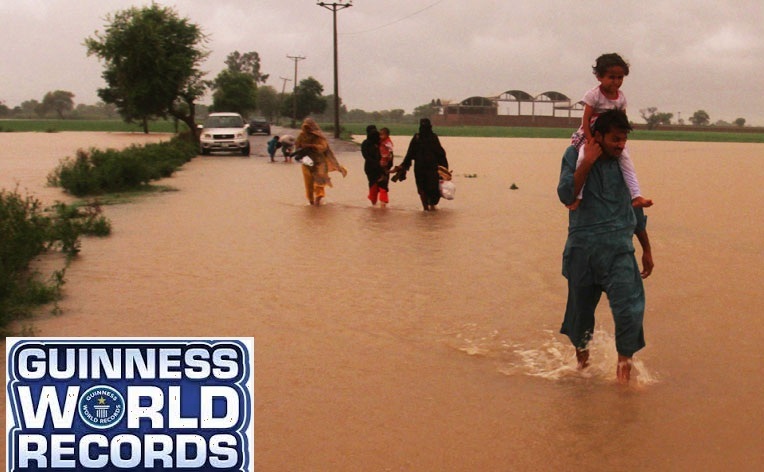 The 2013 flood started after intense rains in the northern areas of the country on August 13 and August 14, according to the Natural Disaster Management Agency (NDMA) atleast 178 people have died while 855 are injured, current floods have affected 1.5 million people across Pakistan. Were these rains enough to cause floods? Heavy monsoon observed in NE Pakistan. 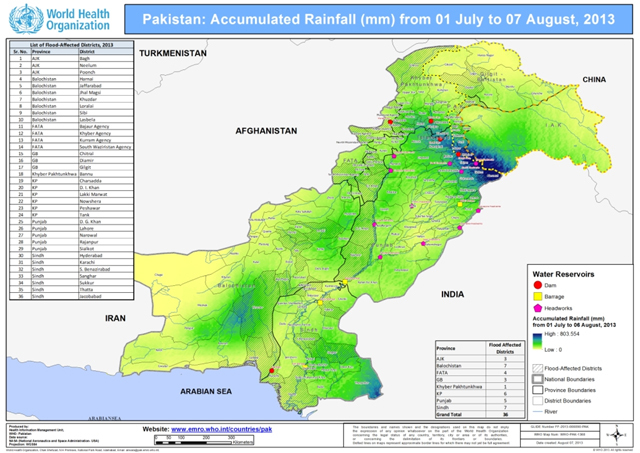 This year the behavior of monsoon had been erratic, most part of the country witnessed normal to below normal rains while parts of Balochistan and northern strip of the country (Islamabad, north Punjab, Azad Kashmir and adjoining Khyber Pakhtunkhwa) has witnessed normal to above normal rains. Despite that, the rains should not have caused flood situation to go out of control as during normal monsoon there are frequent intense rains in the north. This monsoon there were one to two ‘scattered to widespread heavy downpour’ rest of them were ‘isolated to scattered heavy downpour’ in upper parts. In 2010, 2011 and 2012, the floods were caused by record-breaking rains, not the case in 2013. The World has severely criticized Pakistan for their lack of preparedness during the monsoon season while no major precautions were taken as the infrastructure damaged during the 2010 is still in ruins! Nothing learned: Getting flood since 2010! Our government is least bothered about the monsoon season they only get up from their sleep when the country is under water, the good news till now is that there is no threat of heavy downpour in September in southern and central parts while north may have a monsoon spell. Since the people of this country are left at the mercy of nature, my personal wish is that monsoon should withdraw from Pakistan in coming days! I am very sorry to hear about the flood damages and loss of life and injuries caused by the Pakistan-Arabia Dust Cloud. The NAAPS image for those dates showed that the Dust Cloud had moved aside and opened the door for floods in the north, and at the same time had formed a solid north-south wall to the west that stalled the rainfall, causing the floods. See /http://www.ecoseeds.com/clouds_8-15-13.png. I am hoping that the Pakistan government weather service will start daily monitoring of the Dust Cloud, so that when the Dust Cloud leaves an area, plus at the same time forms a wall to stall the monsoon, that the people are warned of potential floods. Also, that a plan is funded by the government to eliminate the Dust Cloud all together, so that Pakistan does not have to be subject to these drought-flood cycles, which will continue to occur until the Cloud is brought back to earth. The easy way to stop the Dust Cloud is by replanting the desert lands between the border of India and the Indus river with native plants, to keep the soil from getting airborne. It has been brought to their attention but so far they are mum on this theory. Aasalamulaikum! Babar Bhai. Feels like that most people are loosing interest in the portal. No such comments like July and early August. The Question is that why monsoon lost its intensity so early? It looks That the coming tenth Spell is last Spell of the Monsoon 2013 Season. And lastly about the dust cloud it affects only the monsoon season or it affects the winter season also? Thanks!!! Yeah, active monsoon means more activity on this blog. I think Monsoon continuing in September in Sindh is unusual like in 2010, 2011 and 2012, it mostly ends early in the province. There are chances of 11th spell in the north as well. Yes it affects both. Would it be helpful, until the Pakistan government weather service starts daily monitoring of the Dust Cloud, if I see something that might cause floods, to post that information here for your readers? We have to rely on these rains to get through the scorching summer heat, I think better wish would be for monsoon to start behaving, lol. Very hot today and waiting for rain to come again. Sky has scattered white clouds as of now, maybe the spell will be starting soon.. Yes the Rains are necessary. Today monsoon rain clouds are stuck in India, that want to gently bring rain to the dry parts of Pakistan, but they are being blocked by the edge of the Dust Cloud, that you can see at http://www.ecoseeds.com/dust-8-26-13.gif and http://www.ecoseeds.com/clouds-8-26-13.gif. The Pakistan government weather service has very sophisticated weather tracking maps on their web page, and it should be very simple to add the daily Dust Cloud map, and also give weekly drought and flood warnings for everyone in the country, like what we have been doing here on your Pakistan Weather Portal site? Thats an interesting point you have there, if this is the case why hasnt the government already done anything? Does the dustcloud cause the same cycles in the adjoining indian areas ? And the rains have begun 😀 just woke up to heavy rain in islamabad, is this the 10th monsoon spell ? Yes they are a result of the 10th spell. The monsoon is not weakening, it is the Dust Cloud getting stronger, and today it has pushed far into India according to the NAAPS map, but it is forming a pocket near the northern part of Pakistan, and perhaps flooding again might occur, and the central and southern part of the country may stay dry until the Cloud moves westward. So who manages the desert land between the Indus and the border with India, that is the source of the Dust Cloud? Is it privately owned, or is it open rangeland free for anybody to use for their animals? Monsoon is withdrawing from Southern Pak as no spell is seen in September either. Most of the land is privately owned and the rest belongs to the government. Every year i travel from islamabad to Rahimyarkhan which is right at the edge of the Punjab province. Every year i aee more and more desert land being reclaimed and converted into agriculture uses. There used to be hige sand dunes next to the highway when i used to travel 6/7 years ago but now you can see crops everywhere. Maybe any of the government owned land between the Indus River and the border with India, might be the first place to stop the Dust Cloud? The Dust Cloud unites both countries ecologically and weather-wise, as when the Cloud is strong, it spares neither Pakistan nor India. So when there is drought in parts of Pakistan look for floods in parts of India, probably this week. Kya Sindh se Monsoon withdraw hochuka hai? No it is prevailing though has weakened significantly. Chance of rain in Sindh went from none to slim as GFS shows a low pressure moving from Gujarat to Sindh during 10th September. Today, the Dust Cloud is at its maximum coverage for the year so far, over all of Pakistan and over about 1/3 of northern India, looking like a hat. That means potentially, dry, dry, and dry, until the Dust Cloud moves westward again. The Dust Cloud has quieted the monsoon for now, covering all of Pakistan and the northern third of India today, so dry conditions may remain for a while? Rain (light to moderate) continues to fall in the north.